Billie found her inspiration for this season through her previous experiences working in a bakery. She has based pieces in this collection from the bakery products themselves, embracing the early mornings and long hours by incorporating bright colours and bold designs. Billie shows her optimistic and positive personality through her designs, turnung the negative aspects of her experiences into positives. 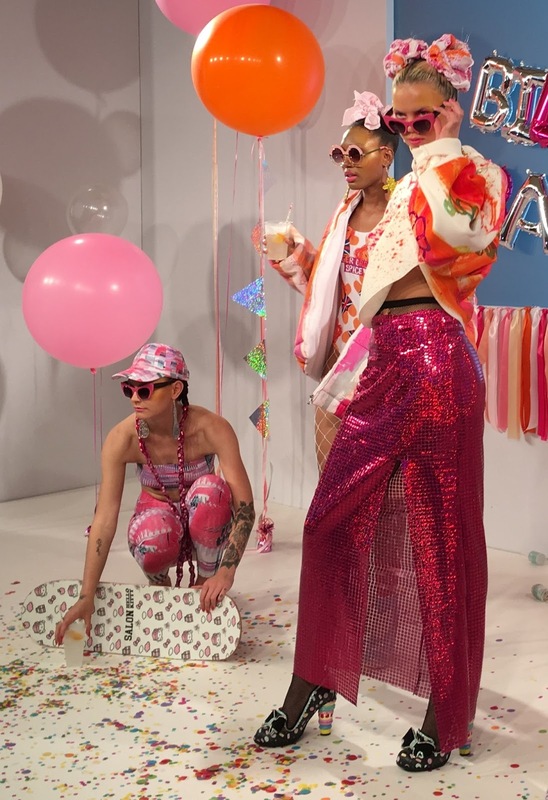 This collection illustrates that fashion is able to overcome boundaries, open opportunities and uplift moods. 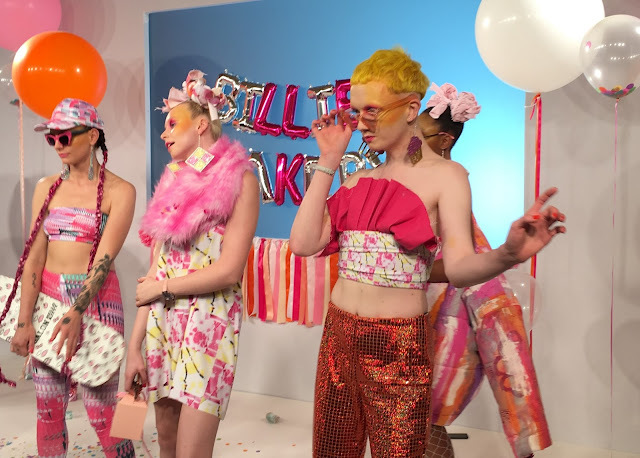 To create her vision this season, Billie has used a combination of hand painting and digital printing. 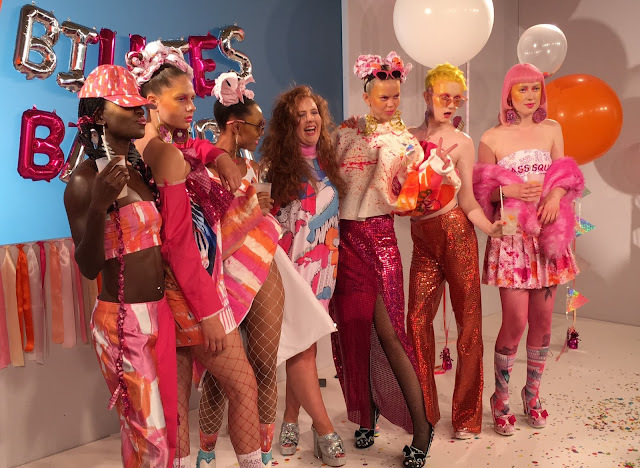 Whilst ensuring she stays true to her trademark colour pink throughout her work, Billie has chosen to also incorporate shades of orange into her designs for SS18. By doing this, she ensures her designs remain both recognizable and unique in their colour palette. What's more, this season she collaborated with No Basic Bombshell for the collection's accessories. 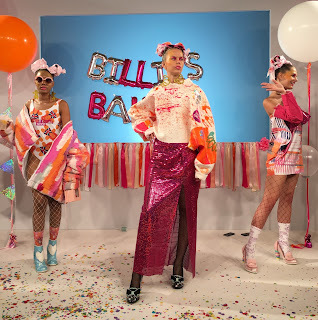 Led by Natalie Farouz, No Basic Bombshell works in harmony with the vibrant and playful nature of Billie's collection. I mean, have you seen those doughnut earrings? 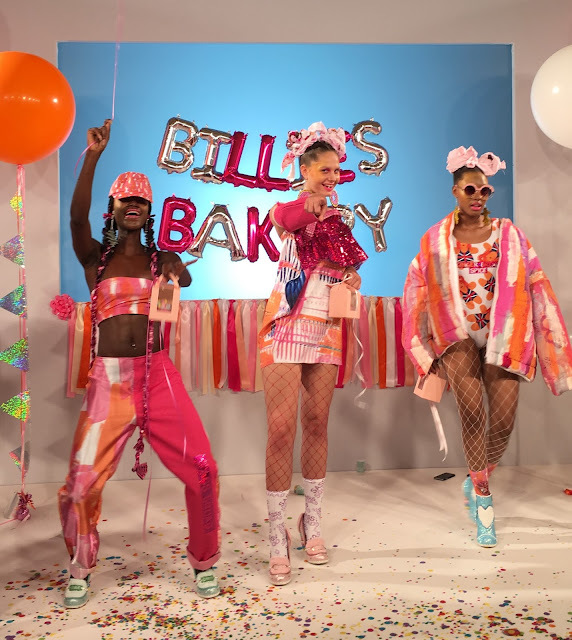 Billie has also gained sponsorship from Irregular Choice, enabling her to make her footwear vision a reality. I would like to mention that the presentation was far from just a presentation. It felt like a party with the dancing models and the cheerful mood everybody had. We could also enjoy some treats and cocktails from Freya, the world's first spirit distilled from birch sap. For those who don't know Billie... since showcasing at Graduate Fashion Week in 2016, Billie Jacobina went on to win Fashion Scout's "Ones to Watch" for her SS 17 collection and has recently been awarded the position of and Artist in Residence for the next year at UCA. Make sure to remember her name because with her unique style, she is going to become a big name in the industry.